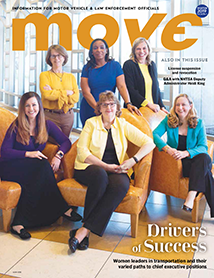 MOVE is the flagship publication of AAMVA and winner of multiple national magazine awards, including a 2017 FOLIO: Ozzie Award; 2017 Hermes Creative Award; 2017, 2016 and 2014 APEX Awards of Excellence; 2016 and 2015 AM&P EXCEL Awards; and a 2014 Pearl Award from The Content Council. With a quarterly print publication and new interactive online format, MOVE‘s feature articles and columns keep readers informed of industry news and technological developments throughout the motor vehicle community. MOVE magazine print and online offer a wide-range of industry topics. From updates on policy issues and regional news, to feature stories, Q&A’s and statistics, MOVE provides a variety of unique articles. Not only does MOVE captivate readers with entertaining and informative feature stories, member contributors can also submit their perspective on issues facing their jurisdiction in MOVE’s Crossroads and Musings sections. Interested in advertising in MOVE magazine? For editorial inquiries, please email move@aamva.org.